Is there anything more enjoyable than lounging outside on a summer evening, watching an excellent play and enjoying a picnic at the same time? Well, that is exactly what Heartbreak Productions Open Air Theatre audiences can enjoy this summer at many venues up and down the country. At a garden party hosted by Lord Cava, his nephew Charles, the heir to Cava's Sparkling Wines, is found dead under mysterious circumstances. Enter Inspector Back (of the Yard) an imposing yet exasperated detective who enlists the audience to help solve the case. Murder on the Terrace is a farcical whodunit, packed with an array of kooky characters, shocking plot twists and frankly criminal jokes! The original script by David Kerby-Kendall features countless pop culture references, as well as one or two obligatory song and dance numbers, and audience participation throughout. The audience participation element in particular is a big hit, with audience members being called up on stage to take part in murder mystery themed quizzes and games, as well as being encouraged to take on the role of detective and interrogate characters in order to try and uncover the truth. The cast is razor sharp and have great rapport with one another as well as with the audience. Their multi-roling is impressive, and is also used to great comedic effect within the plot. James Edwards is brilliant as Lord Cava, a despicable toff who isn't afraid to incriminate himself in order to show his disdain for his dead socialist nephew, meanwhile Amy Gardyne has some excellent one liners as Ellie, the Cava's hapless maid, and also impresses as Lady Caroline, Lord Cava's daughter. The whole cast works together as an excellent comedic ensemble, and is led by Benjamin Thorn as Inspector Back, whose sighs and exasperated glances to the audience bring about some of the show's biggest laughs. Pedantically, there are several glaringly anachronistic plot elements, some rather provocative stereotypes, and a rather inordinate disregard for the fourth wall (even for a tongue-in-cheek comedy! ), which may throw off a few audience members who are unfamiliar with the genre of farce. Similarly, the absence of political correctness may initially elicit a few uncomfortable chortles. However, once the tongue in cheek nature of the script is fully established the audience is able to relax and engage with the piece more comfortably. 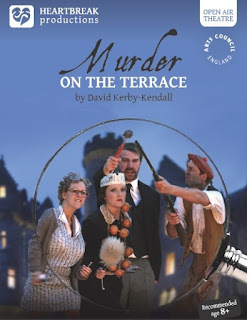 All in all, Murder on the Terrace is excellent fun, particularly for those who would consider themselves Agatha Christie or Poirot aficionados. The jokes come thick and fast, there is innuendo to spare, but wrapped up in all of the comedy is a rather neat and genuinely intriguing murder mystery story. Visit www.heartbreakproductions.co.uk to find the full tour schedule, book tickets, and read about 3 other plays also being toured by Heartbreak Productions this summer. Thanks to TheatreBloggers for the invite!